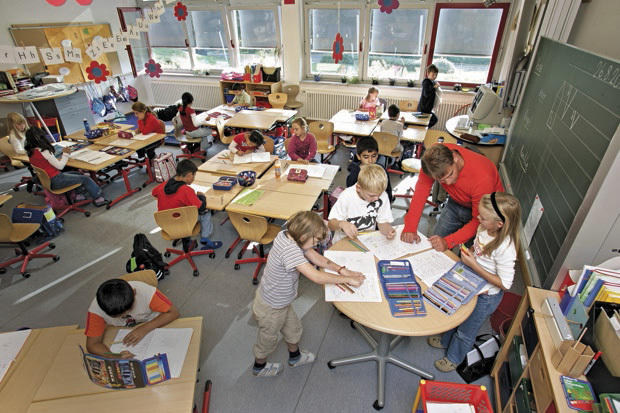 The kindergarten classroom’s flexible environment supports dynamic teaching and learning–so why don’t we use it for grades 1-12? environment. Great alternatives to this outdated spatial arrangement are entirely possible. the new Media Lab building.The new home of the MIT Media Lab designed by Fumihiko Maki is an exponential scaling up of the kindergarten classroom. Individuals from a wide range of disciplines collaborate to develop new products and processes to solve complex problems and enhance the human condition. The MIT Media Lab is research- and action-oriented–the result is not a whitepaper or a publication but a prototype of the solution. The space’s transparency reinforces human connection and collaboration. Floor openings and a central atrium also allow for visual connectivity vertically among the multi-story building. The Lab exemplifies the kindergarten environment in its celebration of group work.